This is your story- the story of how you began, how you came into this world, and how- with your birth- the amount of love in the world grew exponentially. Let’s back it up a little bit though. The dream of you actually came to be with birth of your big sister, Kasey. At first, your mama thought that adding one baby to the family with two big sisters would be enough for her. That all changed the moment that Kasey was born- that was when you mama knew that she wanted to have another baby, a YOU. They began to celebrate you the moment they found out that you existed, only this time around they wanted to be totally surprised about who you would be, so they didn’t find out if they were going to have a girl or a boy. The excitement level during this labor and delivery was even more heightened because your mom and dad were overwhelmed with anticipation to find out! It was a long day of building and gaining momentum in the comfort of home. Thankfully your mom and dad had the amazing support of their doula, Danae, to guide them through. I loved that I was also able to check in with Danae throughout the day without having to bother your mama. Finally around 8:35 pm, I got word that they were heading to NAS Jax Hospital, so I jumped in my car and even beat them there. When they first arrived your mama was looking adorable in her pajamas and slippers and other than her pretty big belly, she looked too beautiful to be in labor. Your daddy was loaded down with arms full of bags. After a short stop in triage, at 10:30 pm they were moved into Room 1 where all the exciting action would take place. In between the contraction surges, when your mama was concentrating on relaxing and breathing for you, we spent a few moments reminiscing about the fact that we were all together just 19 months before when Kasey was coming into the world and we were also noting that your story was already looking very different from hers. Your parents shared the names that they had chosen- if you were a girl you would have been Molly Kate or Finn Thomas, if you were a boy. The initial stats from the first check showed that mama was at 6 cm, 90% effaced, -2 station, and your heart rate was around 135. Your dad had to google what the heart rate might mean, and discovered that slower heart rates could mean that you might be a boy. 😉 Your mom made a few special requests so that she could labor more freely and be more in control of her comfort. She requested a hep-lock so that she wouldn’t be attached to an IV pole and instead concentrated on staying hydrated by drinking water and eating ice chips, and she also requested to be on a wireless monitor so she move more freely through the room as she labored. As your mom was laboring, her focus was to try methods that would help you move down and become engaged to help with her dilation. Danae offered your mama all kinds of techniques and worked hard alongside your mom. Around 11:45 pm, discussion began about an artificial rupture of membranes (AROM), which could allow you to come further down to apply the needed pressure and engagement. Your mom was ready to make some progress and so agreed to take this next step. At 12:05 am the doctor performed the AROM and your mom felt an immediate drop of her belly. It was almost like the floodgates had opened and the nurse said that this was the most fluid she had EVER seen. Your dad was proud to be breaking records. The current stats were 8 cm, fully effaced, still a little cervix left, and head well engaged. All good progress! With the breaking of her water, the contractions began to intensify and come more frequently. As 1 am rolled around, so did the 24 hour mark from the beginning of labor. Your mom had been up and working hard all that time and was feeling some of the effects of the exhaustion. She relied heavily on the strength and energy from your daddy and Danae to get her through even when she didn’t quite feel she could do much more. 2:14 am – Check: about the same as 12:00 am, “Baby is right there. Just a little cervix is still left.” Mom continued to try different positions to get you to come down, including the dreaded peanut ball that was so uncomfortable for her. 3:05 am – Your mom’s exhaustion started to take over and she started to feel discouraged. “I can’t anymore. I don’t have any energy.” She was even starting to nod off a little in between contractions. 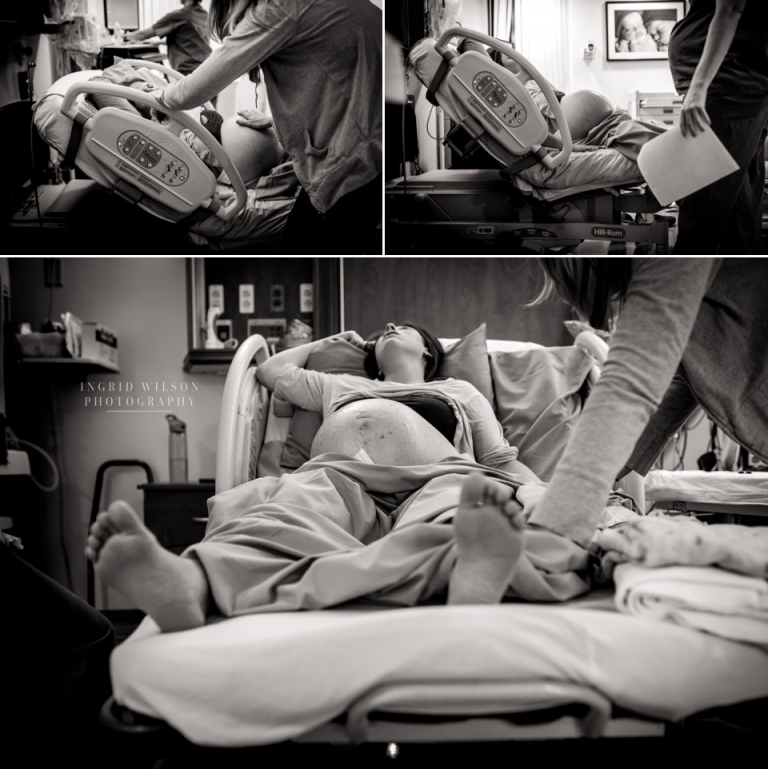 Your mom made the very hard decision to have an epidural and pitocin to help move things along. She struggled with feelings of disappointment but needed some relief so she could continue working to bring you into the world. 7:15 – Changing of the guard – new nurses coming on shift came in to check on the room and get vitals from your mom waking her up from her nap. Your mom woke feeling refreshed but still a bit disappointed and needed a little positive refocusing. She decided to freshen up a little bit to cheer herself up. 7:30 – All the doctors came to check on your mom and they decided that you had likely been OP (Occiput Posterior or “Sunnyside up”), which could have been preventing full dilation, but you seemed to be rotated and in better position now so they were hopeful that you would be able to arrive soon. Just before 10 am, the midwife decided that she wanted to try some pushing to see if that would get the cervix to move. Almost instantly it was clear that you were right there and ready to make your grand entrance! The room became a flurry of nurses moving and prepping, the doctor and midwife standing together to bring you into the world, and your daddy and Danae on either side of your mama encouraging her and providing support by each holding and pushing back on a leg. 10:10 am on Friday, January 27, 2017 you popped into the world and joy erupted in the room. Your dad took one look at you and announced: “We have junk!” meaning “It’s a boy!” HA! You were immediately placed on your mama’s chest and she and your daddy marveled at your perfection. It seemed as if all the flurry of the room disappeared and it was just the 3 of you loving on each other. You were finally here. They now knew you had been Finn Thomas all this time. The first and only boy, the brother to 3 awesome big sisters, the baseball (and every other sport) buddy for your daddy. Another little Red Sock. As they looked over every little bit of you they noticed that you already had your first little boy shiner- a little bruise caused by the position that you were in for so much of labor. You were not thrilled with your newborn exam and wanted to get back to the snuggly arms of your mama. You weighed in at a healthy 8 lbs. 14.8 oz. and measured 20 1/2 inches. I love this – your babinski reflex. This will only last a little while- those little stretched toes. Congratulations to you all! Jess- you never cease to amaze me. You are so strong and determined. You are an amazing mama and I am honored to know you. Thank you so much for inviting me (again) into this most intimate time in your life. I am sad that this chapter is closing for us, but now we are family. I will be forever grateful for that. Finn- You are the most adorable little boy born into a hugely loving family. You made them complete. I now look forward to watching you grow up. Oh the adventures that await you.